With the same ardent affection as a mother for her incorrigible kid, artist Dan Rumain has been Rye Coalition’s designer, muse, roadie, photographer, and friend for almost 20 years. He’s avidly labored over T-shirt designs, album covers, posters, and more for nothing more than a couple chicken parm sandwiches and the satisfaction of helping his NJ brothers out. Dan’s contributed a couple of choice items for our kickstarter campaign, and we couldn’t be more grateful. 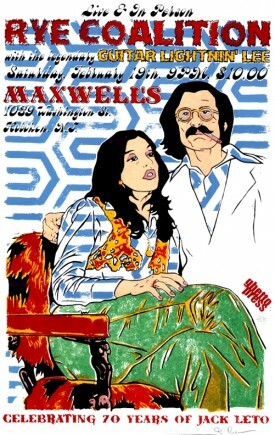 An autographed, limited edition 6 color, 11x17in screen print of the “Rye Coalition Live at Maxwells” show poster printed by Joe Herbick at Ghetto Press (Baltimore, MD) is available for the $50 pledge (pictured below). 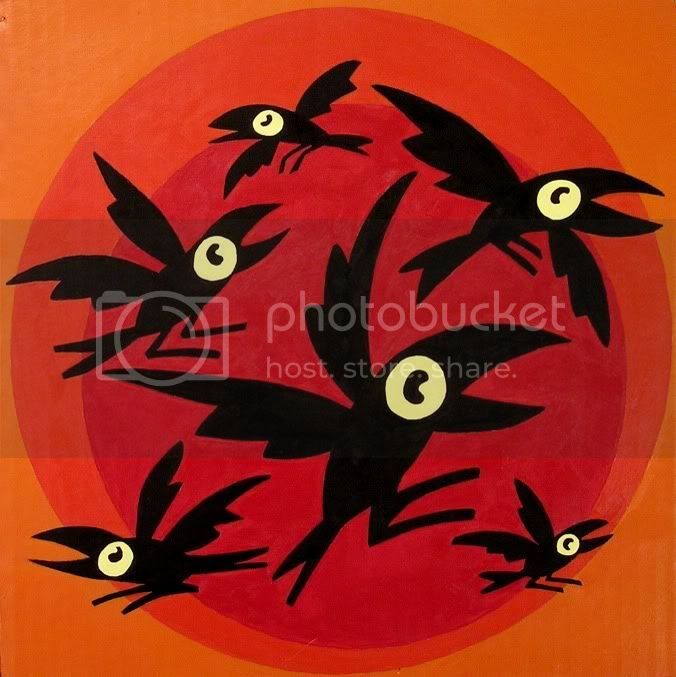 The poster that we are giving away is a hand pulled screen print of a hand-rendered acrylic painting of Jack and Donna Leto’s (parents of Rye drummers Dave and Gregg Leto) wedding picture. The Rye show was Jack’s 70th birthday wish. Dan’s “crows” T-shirt is available for a $35 pledge, also VERY limited quantity! Last but certainly not least, I asked Dan to design a new postcard to send anyone who donates $5 or more. 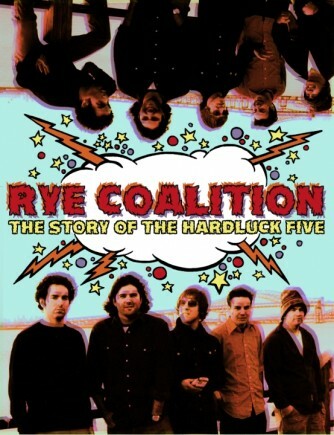 His “Rye through time” collage of the Hard Luck 5 in front of the Newark Bay Bridge pictured above) is just… beautiful. We’ll be sending it to everyone along with a special message from Rye on the verso. I’d say “backside”, but I don’t want to encourage you all. This entry was posted in album art, autographed screen print, Claw & Globe, Daniel Rumain, Dave Leto, Gregg Leto, Herbert Wiley V, Jack Leto, Jersey City, Jon Gonnelli, Justin Angelo Morey, Limited edition, maxwell's, NJ, Ralph Cuseglio, Rye Coalition documentary, Rye Coalition live and tagged "making of", Daniel Rumain, Dave Leto, Hard Luck Five, Herb Wiley, Jersey City, Jon Gonnelli, Justin Morey, kickstarter, limited edition screen print, Maxwell's, Ralph Cuseglio, Rye Coalition, Rye Coalition documentary, Rye Coalition reunion. Bookmark the permalink.